Full of surprises. This kid sure has given us a bunch already! First, we didn’t know we were expecting until I was 15 weeks along – over a third of the way done. No symptoms beyond being tired, and um, with a growing and active toddler, that was life! I’d taken a pregnancy test in mid-February, right before we went to Europe, because I was a couple weeks late and was just starting to wonder. Hey, did you know sometimes you can get a false negative? Also, I’d recommend avoiding CVS generic pregnancy tests! By April, I was training for a marathon. Yes, once again. (Steve says no more marathons because apparently they make us pregnant.) And I noticed that rather than my runs getting easier and faster, they were getting harder and slower. Generally not the way you want them to go. Also, I just started feeling pregnant. No explanation, because I didn’t have any real symptoms. Finally, I took another pregnancy test, and had an interesting 6:00am “We-need-to-talk” conversation with Steve. Although maybe Thing #2 came along a little sooner than we had envisioned, we were very very happy that we would have this addition to our family! Still, thanks to the false negative test in February, we had the shock of a lifetime when we went to our ultrasound appointment the next week. Our baby was not eight or so weeks old like we assumed, but a perfectly formed, 15-week-old BOY. At 38 weeks (around the 15th), I was having stronger Braxton-Hicks contractions. I’d been having them since August, off and on, but now they were far more regular. Between then and when I finally delivered over three weeks later, I’d had about six “events” of regular, relatively strong contractions for several hours. Two had us packing up for the hospital before they petered off. I was exhausted, physically and emotionally. My stomach felt permanently clenched. I was so tired. At my 40-week appointment, we scheduled an induction for the following week. Not my first choice, but I was just ready to be DONE. The plan was to come in on Tuesday the 6th to take cervidil, which would prep the cervix for pitocin the next day. We had a nice, quiet week, finishing up stuff at work, spending time with my parents and Amelia, and resting. When we got to the hospital Tuesday night, we found out I was already 3cm dilated! So I was not given the cervidil and we were offered the choice to stay there that night or go home and come in at 5:00 the next morning. We choose to go home, which was great because we got really good sleep and felt much more refreshed that we would have if we’d stayed. Fortunately the hospital is only about 10 minutes from our house! Unbeknownst to me, Dr Knapp had stripped my membranes a bit while she was checking me. She totally gets me; she knew that if I’d known she’d done that, I would have been obsessing over it and overthinking everything. The next morning, we got up at 3:30 to get ready to leave and by 4:00, I was having regular contractions. By 5:00, when we were walking into the hospital, we had to stop several times for me to get through before going on. We got up to the Labor and Delivery floor, and the nurses weren’t surprised at all to see I was already in labor. Contractions were 5 minutes apart and still not super strong, so I was given pitocin to augment the process. That started around 8:00, and things picked up quickly. I was about 4-5 cm dilated at this point. Steve was the world’s best labor coach, breathing with me through each contraction. I think one of the things that makes a good coach in anything is the recognition that the person you’re coaching is capable of doing better than they realize they can. Steve was definitely that person for me, helping me through the incredible pain that comes with labor and reminding me to breathe and relax. At some point during this first hour, during an intense contraction, I felt a huge POP, yelled, and my water broke. I think I might have scared Steve with the yell. No, but seriously, this water-breaking-pop is the most messed-up feeling. It’s like you know that there is no WAY that something inside you should pop like that. Overall, thanks to Steve’s coaching, I was able to control my breathing and not give way to outright crying out. Labor without a doubt brings you to the absolute brink. But I tried to focus on the contractions as productive tools that would eventually give me my son. At the first holy-cow-he’s-coming contraction, I could tell pressure was increasing, and I told Steve. Okay, maybe more like gasped to Steve. He asked the nurse to check me again, and I was at 7. I heard him tell the nurse that I was going to go fast and that they needed to call the doctor. I think it was only about half an hour later that the doctor arrived, checked me to find that I was 10cm, and got everything set up for delivery. During that time, it was everything I could do to focus on not caving into the pain of the pressure. I remember realizing that my body was doing a one-horrible-hard-two-slightly-less-hard contraction pattern and feeling grateful. I remember wondering why I wasn’t screaming, like I did with Amelia. The nurses were working around me, adjusting the bed and the stirrups while Dr Swan got ready. At the next contraction, they told me to grab my legs and push. But everything was too far away – I couldn’t get a good grip, the stirrups were up to high – and I lost my control (hey, there’s the screaming). 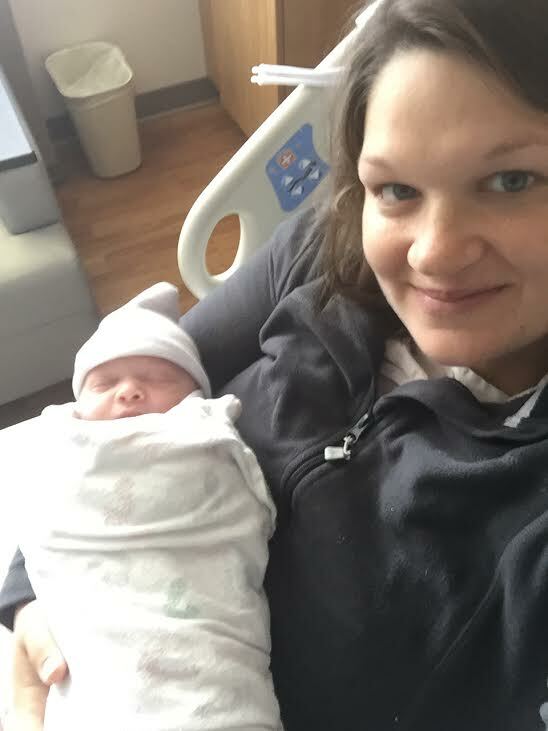 When the contraction abated, Dr Swan said, “The head is right here, this can be all over with in the next contraction.” Steve helped me gather my resources, the nurses gave me better instruction, and at the next contraction, with two pushes, our son entered the world at 11:03am. He has a very nice real name, but on this blog we’re calling him Joel. Dr Swan immediately put him on my stomach for me to hold because the cord was very short. 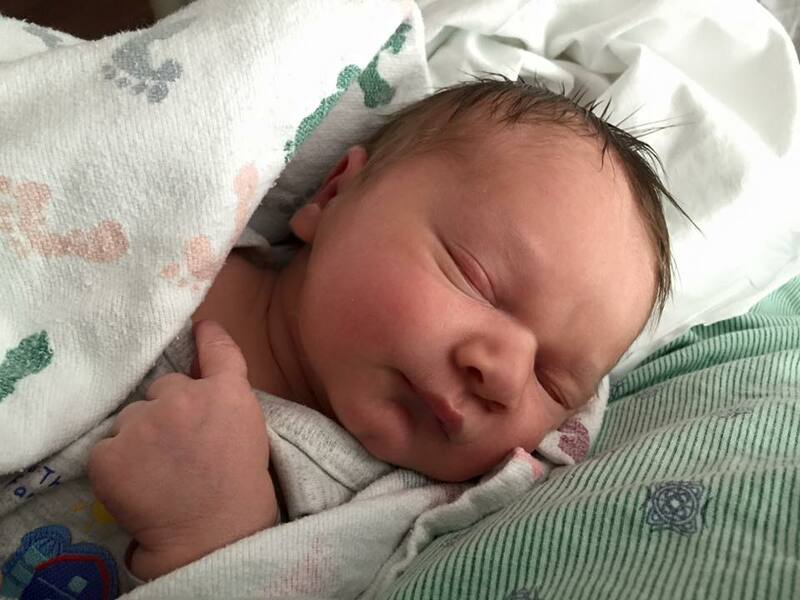 Steve cut the cord, and I pulled Joel up to me and we just gazed at the wonder of our son. His full head of dark hair. His chin dimple. Just perfect in every way. The nurses gave us all the skin-to-skin time we wanted as Dr Swan patched me up. After Joel got cleaned up, we started on nursing and to my shock, he took to it right away. As if he knew what he was doing or something. He’s been a champion nurser ever since. One of my big takeaways from this has been that everyone should have a second baby, just so they can enjoy parts of pregnancy/childbirth/parenting that they were too stressed about to enjoy the first time around! I want to exclusively nurse Joel, but I know that if I can’t, no biggie – he’ll be fine. Once again, we had a great birthing experience at Marion General Hospital. The nurses there are top notch, caring and compassionate, and truly supported our choices to the best of their ability. I definitely feel it’s important for patients to be educated and know what they want before entering into a medical situation, especially childbirth. Recognizing that things can change quickly, too. At one point, the fetal monitor wasn’t picking up his heartbeat, and the nurse asked if we would be OK with an internal monitor (it would go just under the skin of the baby’s head). I was absolutely not OK with that, and responded (I was contracting and somewhat irate), “Nope. Find another solution.” Fortunately Steve was neither contracting nor irate, so he discussed it much more diplomatically. I got up to use the bathroom and by the time I came back, kiddo had shifted and was able to be picked up again on the external monitor. But I am all about being empowered in making health choices. I’m not unreasonable, and if greater intervention had truly been necessary, I would have been more than willing to do so. And now, we’re home. We have a 16-month-old toddler big sister in addition to our six-day-old newborn. The sleep deprivation is back. The soreness and awfulness of postpartum recovery is back. But I feel calm and relaxed. Each day I’m in less and less pain. Each day I’m amazed by God’s gifts. Each day I’m beyond grateful for a mega-supportive husband, parents who have given so much to us, and friends willing to help in any way they can. Steve and I are Daddy and Mommy to Amelia and Joel. And well, that’s just so great. Beautiful story Rachel. So glad we were there for you all.